WASHINGTON (NASA PR) — NASA has selected eight advanced robotics projects that will enable the agency’s future missions while supporting the Obama administration’s National Robotics Initiative. The projects, ranging from technologies for improving robotic planetary rovers to humanoid robotic systems, will support the development and use of robots for space exploration, as well as by manufacturers and businesses in the United States. Robots can work beside, or cooperatively, with people to enhance individual human capabilities, performance and safety in space as well as here on Earth. Co-robotics, where robots work cooperatively with people to enhance their individual human capabilities, performance and safety, is a valuable tool for maintaining American leadership in aerospace technology and advanced manufacturing. “Long, Thin Continuum Robots for Space Applications,” I. Walker, principal investigator, Clemson University, Clemson, S.C. The National Science Foundation (NSF) managed the solicitation and peer review selection process for these NASA awards. Awards range from $150,000 to $1 million, with a total NASA investment of $2.7 million. NASA has a long history of developing cutting-edge robotic systems for use in space exploration. NASA also partners with American businesses, universities and other federal agencies to transfer those technologies back into the nation’s industrial base, improving manufacturing capabilities and economic competitiveness. Recently, tremendous advances in robotics technology have enabled a new generation of assistive systems and devices in industries as diverse as manufacturing, logistics, medicine, health care, military, agriculture, and consumer products. As part of the National Robotics Initiative, NSF, NASA, the National Institutes of Health and the U.S. Department of Agriculture have managed a joint solicitation, seeking to engage our next generation of roboticists for the new global technology economy. All participating federal agencies are working with partners to foster the exchange of ideas and technologies that will directly benefit American today and well into the future. The purpose of the initiative is to encourage innovative collaborative research that combines computer and systems science with mechanical, electrical and materials engineering and social, behavioral and economic sciences. The resulting research will tackle the most important and challenging problems in producing this class of human-assisting co-robotics. 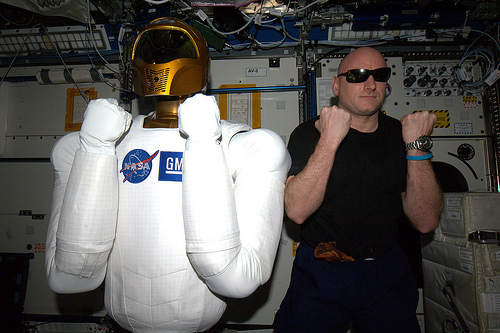 NASA’s Office of the Chief Technologist and the Space Technology Program lead the agency’s participation in the National Robotics Initiative. NASA’s Space Technology Program is dedicated to innovating, developing, testing, and flying hardware for use in NASA’s future science and exploration missions. NASA’s technology investments provide cutting-edge solutions for our nation’s future. There needs to be some standards set in the development of robots. Everyone feels the need to develop entire robots entirely from a blank sheet design. What is developed for one cannot be applied to another. Researchers should focus on developing one part (hands, gait, facial gestures) and then be able to plug them into the work of others through standard connectors. Just my $0.02 worth.